Principal Patrick Larkin from Burlington High School in Massachusetts has this advice for administrators who are considering whether to embrace cell phones as a learning tool, “Start now. 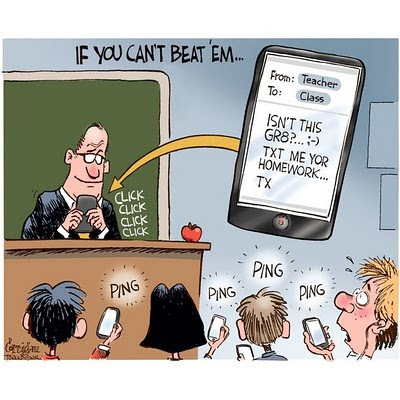 If you haven’t embraced cell phones as learning tools, you are missing out on a valuable resource to engage students. At the very least you can save money on the response systems that many companies are pushing in schools.” Kurt Clay, a progressive principal in Delta, Colorado, uses a free group messaging service to reach his staff for encouragement, with teaching tips, announcements, and is set up for crisis response. Realizing the time saved and the improvement in communication with staff, he has now started using group texting to encourage the home-school connection. Delta Opportunity School leaders use group texting with response to a Wiffiti board or a Poll Everywhere poll to gather ideas and encourage communication with students, staff, and parents. Improved input and better use of meeting time have been some helpful results. Innovative educators, know that when an administrator is on board with using technology in the classroom, it becomes much easier for the entire school to follow suit. Whether you’re an administrator who wants to try these ideas out or a teacher who wants to help an administrator get on board, here are specific ways that administrators are using cell phones to do their jobs more efficiently. Assistant Principal Jacek Polubiec uses texting 24/7 to communicate with teachers and administrators. Texting enables him and his staff to reach one another regardless of where they are physically. For example, it’s not unusual for a staff member to text him at night when they are not feeling well and might be absent the next day. This allows Polubiec to update the Google doc that his school uses to post daily announcements with this information and enables him to get a jump start on being able to plan accordingly. The visitors to the Academy Mr.Polubiec supervises are encouraged to text constructive feedback on academy’s hallway learning displays (aka bulletin boards) to Poll Everywhere. This kind of continuous feedback using technology is the backbone of virtual learning walks in which his staff engage. As instructional leader and manager of the school organization Principals must engage in ongoing communication with staff, parents, and the community. Group texting is a free tool that saves time and enhances communication. By collecting the cell phone numbers of students, staff, parents, and community stakeholders and setting them up in a group text service, a principal can easily reach the masses with one text message. Kurt Clay, Principal of Delta High School, knows this first hand. Kurt had his secretary put his staff numbers into a group texting service so he could be in contact for emergency response notification and crisis announcements. It wasn’t long, however, before he realized the service could have utility far beyond what he originally intended. Soon he was sending group texts to staff for encouragement, information upcoming activities, scheduling updates, teaching tips, meeting announcements, and more. He found his staff meeting time to be much more productive when he could send out questions or cues before and start the meeting ahead on the agenda. After meetings he texted key points right into his staffs’ hands knowing they literally all left the meeting with the same take away. After seeing how effective this was with his staff, Principal Clay decided to use group texting to increase the home-school connection with the parents of his busiest students. His seniors. After establishing that group, Principal Clay could now send out important dates and reminders crucial to the success of these students. Principal Clay plans to expand this to all of the parents in his school as he’s found it an effective and efficient way to establish ongoing communication with student’s families and along with that comes the added bonus of saving money on printing and mailing of information that adds up significantly in the school budget each year. Next for Principal Clay is moving from straight texting, to incorporating free response boards and polling questions to send out questions before meetings with staff, parents, and students so their input is available at the start of the meeting. This enables him to make the best use of everybody’s time and improve communication. Principals will make parent night, staff meetings, and school assemblies a true example of two-way communication with the use of free response boards such as Wiffit or a free text poll in Poll Everywhere. By sending out a group text with a question or request for input and the number and code to send the response to, everyone in the group has the opportunity for input prior to or during the event. Delaine Hudson, Principal of Delta Opportunity School shares a frustration familiar to educators around the globe. Her weekly Professional Learning Community (PLC) meetings are always rushed and end to quickly. There’s just never enough time. Principal Hudson decided she’d try seeing if creating a free response board prior to her meeting would help. Two days prior to her upcoming PLC meeting Mrs. Hudson sent everyone a text with a Wiffiti number and code and the request for input on the main agenda item for the upcoming meeting. Throughout the next two days all of the participants were able to focus their thoughts, share their ideas, and prepare for the meeting. At the meeting Mrs. Hudson was able to display everyones’ thoughtful input immediately by sharing the Wiffiti screen. The PLC time was more focused and communication more effective with the easily referenced responses right in front of each participant. Also, the privacy of being able to text input and the anonymity of the code names Wiffiti assigns created an atmosphere of true sharing. Principal Hudson found the use of a free response board not only saved time, it enabled her to collect thoughtful contributions from all who wanted to share their thoughts resulting in better communication among all. Polling services such as Poll Everywhere enable administrators to let those who they want to reach out to know they value their thoughts and opinions and want their input. Jacek Polubiec has used both free text and polling successfully during classroom learning walks. At Polubiec’s school learning walks serve as a professional development experience for staff who know exactly how to text observations into polls and free response observations. Those on the walk text in their answers which automatically populate onto the school wiki and during the debrief, learning walk participants can get to the thinking and discussing faster because results and data are already collected, tabulated, and ready for discussion. “Using cell phones in this way has enabled us to take learning walks to a whole new level enabling us to capture data easily using a tool all staff members already own with free technology tools,” said Polubiec. Principals like Eric Sheninger and Principal Matt Brown from New York use Twitter as a powerful microblogging tool to help strengthen the home-school connection and give the school community a lens into what is happening in the school. Both principals feature Tweets on their school website where visitors can be sure to find shout outs to students and teachers, upcoming events, timely announcements, and more. 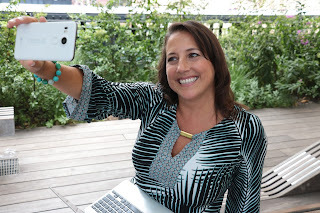 When connecting Twitter to your cell phone, you can Tweet on the go even as you are face-to-face with a student, teacher, or parent letting them know you’re so excited you are going to shout (or in this case Tweet) it out from the virtual school roof top. Students look forward to sharing their Principal's Tweets with family and friends...especially when they are the star. Principal Sheninger’s Tweets now serve as a news feed for local media outlets interested keeping their finger on the pulse of what is happening in progressive schools today. As a result Sheninger’s school is regularly featured in the paper, on radio, and television celebrating the work of his students and staff. Having the knowledge and power to control your digital footprint in the message that is being spread about your school is powerful, and Sheninger enjoys using his phone and Twitter as a vehicle to make that happen. I had the pleasure of meeting a principal of a K-12 virtual school who uses photo capture as a powerful tool to capture students all year long in a number of ways. While it is extremely valuable to create an ongoing collection of images that connect students throughout the year at a virtual school, the same is also important to capture memories in traditional brick and mortar schools as well. At the virtual school students and their parents come together at times across the year for fieldtrips and workshops. At these events everyone is encouraged to snap photos with their cell phones and email them to the school Flickr page. In the subject they indicate who is in the picture and in the body they share something about what they were doing. Following each event a photo album is posted on the private school site so all students and families can look back at the event. Because Flickr lets you set up an email with a tag no work is done on the part of the Principal. The pictures are automatically collected into the album. All she has to do is copy and paste the code into her website. Something she enjoys having her teachers do with lower elementary grades is following each unit they ask parents to use their cell phones to take a picture of their child’s end of unit project .They send these to the Flickr email with a title in the subject and description in the message. The projects are posted on the teacher’s site and the students (and parents) love looking at and commenting on one each other’s work. The Principal loves showing off student work to those who visit her school. As we surge ahead into the next decade of the 21st century it’s nice to know there are innovative administrators out there like the ones cited here who are not only following, but also leading the way for educators, parents, and students to leverage the tools already available to them. I applaud these leaders who are not only thinking outside the ban, but actually breaking it to do what is in the best interest of their school community. Lisa Nielsen and Willyn Webb begin_of_the_skype_highlighting end_of_the_skype_highlighting are co-authors of Teaching Generation Text (Fall 2011 release). Webb and Nielsen are prolific and well-respected experts in the field of education and innovation with more than 20 years of combined experience working to support students, teachers, leaders, and parents. As frequent conference presenters, keynote speakers, and published authors, Nielsen and Webb are often the go-to persons when the media wants to know what works in educating today’s students.